The women mentioned in yesterdays posting made it through her medical procedure OK and since the subject of death is on the table here’s more to contemplate. I think Emma Thompson is wonderful in what ever she does and her part in the film Wit is no exception. One might think that the story of a woman undergoing aggressive treatment for cancer would be a sad one. After watching the film last week I was left both uplifted and stilled. It pointed out that illness, terminal illness, can transform into a gift that helps the heart to walk through the flapping door of death, with equanimity and humility. *Interestingly the literary scholar portrayed in Wit was an expert on John Donne. His poem on death was skillfully woven into the story, I believe it was Death be not Proud that was quoted. Oh, and while looking around I see this, perhaps the best know of John Donne’s ‘Meditations’. “No man is an island, entire of itself; every man is a piece of the continent, a part of the main; if a clod be washed away by the sea, Europe is the less, as well as if a promontory were, as well as if a manor of thy friends or of thine own were; any man’s death diminishes me, because I am involved in mankind; and therefore never send to know for whom the bell tolls; it tolls for thee.” (See here for the full work). I think Donne would be quite at home with Indra’s Net and the Buddhist teaching on interconnectivity and he certainly didn’t shy away from mortality. Previous PostBirth and DeathNext PostLost, Stolen or Strayed? The topic of death was a very strong one for me when I was only 18, 19 and in my early twenties as I lost so many friends to AIDS at that time. Luckily, I myself never became infected, but it was so difficult for me to watch people my own age suffer and die. I think perhaps that was the first thing that moved me to go to Shasta Abbey. Of course, over time, I knew people who thought they were going to die from the disease and had found peace within that, only to suddenly receive new medicines that have extended their lives, perhaps indefinitely. Many of my freinds I know had to rethink the “death-thing” with the “life-thing”. For some this is difficult, but when I asked a close friend how he was dealing with knowing he might live a “normal” life span, he simply said, “No different than if I were going to die tomorrow”. And he had a serene smile on his face. What a great lesson…although I’m not there yet, I have seen a fine example. Just wanted to share! I had a friend in the 1970’s who had been a heroin addict in London. Then one day he looked around him and realized most, if not all, of his friends were dead. So he quit. He and others I have met struggle with being the one who survived. Even people who pull through a surgery like the person I have been mentioning these past couple of days have to get used to the reality of being alive. Being at the wheel of a car in an accident where a passenger is killed can be crushing. Thanks Jack for talking about those dealing with the ‘living-thing’. Maybe we met at Shasta, I was there during the 1980’s. By coincidence(?) I read your post after reading a review of Benjamin Britten’s setting of The Holy Sonnet’s of John Donne of which Death Be Not Proud, is one. It is also two year’s almost to the day since a good friend died of ovarian cancer: she declined treatment (it was far advanced), and I remember well how much pleasure and laughter there was in those remaining months. Offered in her memory. Jack, I think I was working in the Guest Department when you came to visit…do I remember you even? 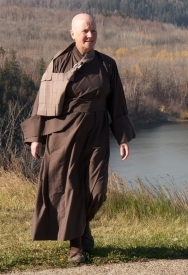 Are you aware that there is a monk of our Order living and teaching in the same country you live in? And Walter, What _is_ it with these coincidences?!! I’ll have to look out for the piece you mentioned, it will give me a change from the bird song CD! Reverend Mugo, yes I know that Reverend Fuden is here in Germany and what a blessing it is to have him here! If you’d like to know a little bit about my journey within Buddhism, I wrote about it in my blog “Road to Jukai”. I’m finally going to Jukai in April at Throssel, 20 years after I started to have the wish. It is strange sometimes how long it takes to find one’s way and then suddenly there is an incredible burst of spiritual growth…that is what I’ve been experiencing the past two years. Jack, In your article you mention the monk who was Guest Master at Shasta when you returned and how you are grateful for his kindness. The monk was Rev. Master Kinrei, he is now the prior at Berkeley Buddhist Priory. If you want, you can write him via their web site. Reverend Mugo…it is really wonderful to know who the monk was/ is! I can still see his kind face when I close my eyes and see back in time. It’ll be wonderful to send an e-mail this weekend!